Apps for Good describes itself as being an open-source technology education movement. The organisation works with school educators and other learning centres. The course that the organisation offers is provided to people that are aged between 10 and 18. Their goal is to teach young people to create apps that change their world. Apps for Good offers course content, training and connections, and these are given to expert volunteers. After this teachers are left to guide young people through the course. Throughout the programme there is a big focus on the practical aspects. Students are encouraged to think about real issues that cause them concern and to then go ahead and build an app that is either social, mobile or web based, to help to rectify the problem. As a result, the student are taken through typical entrepreneurial processes such as concept generation, exploring the feasibility from a technical perspective, programming, product design, devising business models and marketing. The concept of Apps for Good first started to become a reality when the programme was created in September 2009. Dell provided some support to allow Apps for Good to pilot a trial version of the course in South London at High Tees community centre in March 2010. Just nine students, one educator and three experts were involved. Three apps were created as a result of this course. By September 2010 Apps for Good launched as an after school club in Tower Hamlets at the Central Foundation School for Girls. In this case, 25 students were involved and an Apps for Good alumni received training as an educator and was supported by five visiting experts. 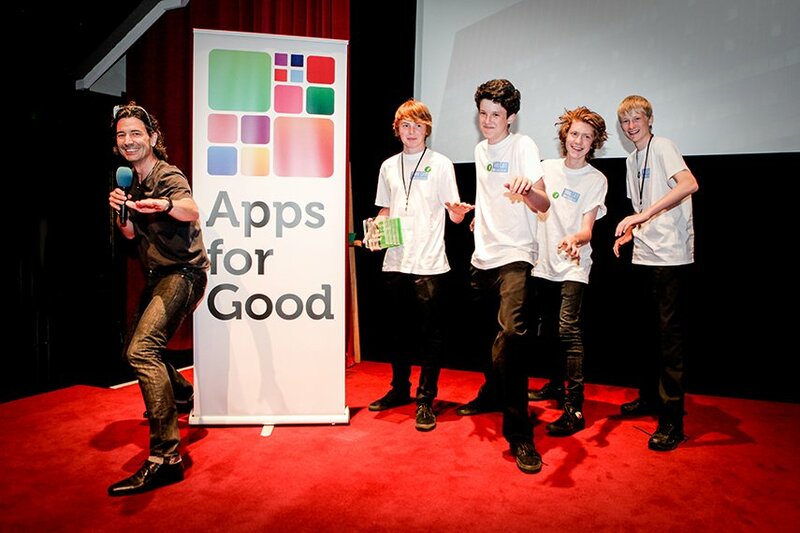 By September 2011 the Apps for Good course was launched across England in 28 different schools, with 1,250 students benefiting and 30 experts sharing their knowledge. Just one year later, 97 schools were involved with 6,200 students on courses and 150 experts involved. By September 2014 growth had been phenomenal and 20,000 students were benefitting from the course in 400 schools. How this is undertaken is by teaching the basics of digital technology to students. The students are taught the full software product development process, using an approach that is extremely hands on. As well as coding, this helps to develop other skills in students which include problem solving, teamwork, creativity and communication. Students are assisted to build prototypes. Expert volunteers are available to help throughout the programme. Experts are brought into the classroom who can help to offer perspective. These experts include both technologists and entrepreneurs. Mentoring is provided by experts, and this can be done either face to face or using video conferencing tools. This provides a sounding board for ideas for students, as well as a way to get inspired. Of course since teachers may not necessarily specialise in this area, experts are also at hand to offer support in covering the more difficult topics of the course. Given their industry experience, experts can also provide perspective and context to the course. Students that do really well in the course may stand the chance of winning an award. The Apps for Good organisation runs an award ceremony at the close of the academic year. Within this it provides awards to the best student apps teams. These are selected from across the UK. This provides an extra motivation for students to do well at the course, and pay attention. Students that are awarded have the opportunity to become real life entrepreneurs having their apps launched commercially with the support of Apps for Good and its sponsors.